Sacramento gives you a host of ways to adventure, whether you&apos;re looking for adrenaline-pumping thrills, family-friendly times or even just checking out some new foods in America&apos;s Farm-to-Fork Capital. Whatever your passion, make sure to stay in one of Sacramento&apos;s convenient hotels. Sacramento&apos;s sunny climate makes it the perfect place for outdoor fun, either within the city or a short drive away. Sacramento sits at the confluence of the American and Sacramento rivers, and locals and visitors alike enjoy spending time where they come together at Discovery Park. The park boasts a nice beach, covered picnic areas, plenty of grass to spread out a blanket or play a game of pickup baseball, and even an archery range. Also running through the park is the American River Bike Trail, which heads all the way to Folsom Lake, 32 miles to the northeast. 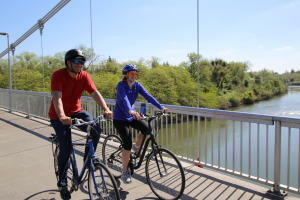 The fully paved trail is great for leisurely cyclists who rent bikes at Old Sacramento&apos;s Practical Cycle or the avid riders who are looking for mile after mile of uninterrupted trail. Fancy taking the adventure onto the river? Head up to nearby Coloma where gold was discovered in 1848, and after visiting the Marshall Gold Discovery State Historic Park, hop into a raft and enjoy the rapids on the American River. California&apos;s capital city is a great place to explore with families. From historical attractions that are so fun the kids won&apos;t realize they&apos;re learning, check out Sutter&apos;s fort and the State Capitol. 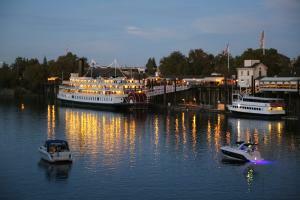 Other family-friendly places include Fairytale Town, the Sacramento Zoo and, of course, stepping back in time in Old Sacramento, where you can walk the wooden sidewalks, soak in the ambiance of an Old West town and take a break with an ice cream cone or a trip to one of several candy stores. 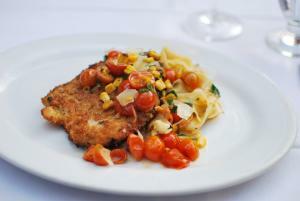 When you want the best, you go to the source, and Sacramento is the source of great food. Thousands of acres of boutique farms surround the city, and farmers deliver fresh food to Sacramento chefs every day. There&apos;s a good chance the produce on your dinner plate was picked that morning. So where do you get started? Check out one of the region&apos;s many farmers markets, then stop for lunch at a restaurant like Hook & Ladder Manufacturing Co., where the garnish on your craft cocktail is most likely locally grown, too. Have an afternoon stop at Devine Gelateria, which uses local produce in its Italian-style gelato, and finish the night off with dinner at a restaurant such as Grange, Ella or Mulvaney&apos;s for a great meal that truly provides a flavor of Sacramento. Will work as a local in the Lake Tahoe Basin?